Having gone to flying legends recently at Duxford in UK, and always having a love affair with the cat, it seemed only a matter of time before I made one of these. 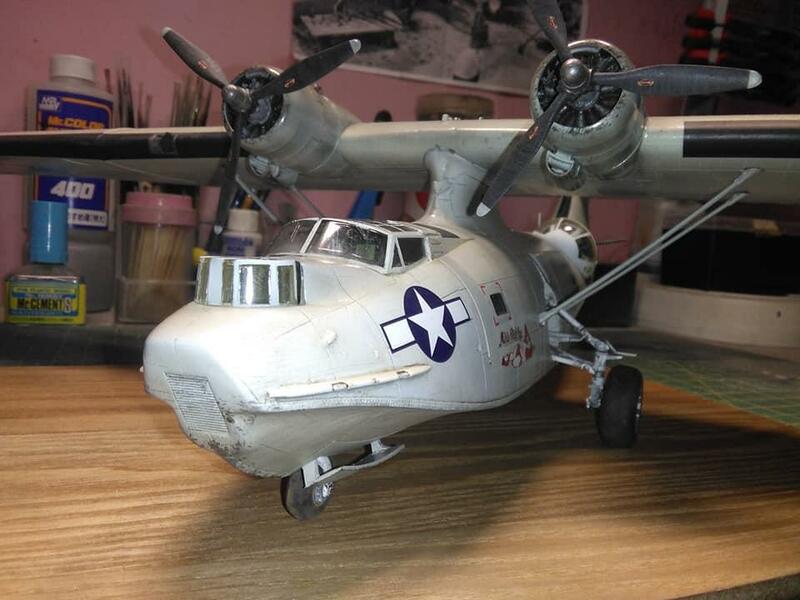 This is the old 1/48 scale Revell/Monogram kit of the Catalina with AM decals, and even in 1/48… it’s big. For an old kit, the fit is no problem and the surface detail stands up to today’s standard no problems. It is not often to see a Cat built up. A good one as well. You know it feels that this kit did not come out so long ago. But it is about 20 years old now. Seems it was just awhile ago when it was first released. Love the scheme and the subtle weathering. Oil streaks around the engine cowls, nice touch. 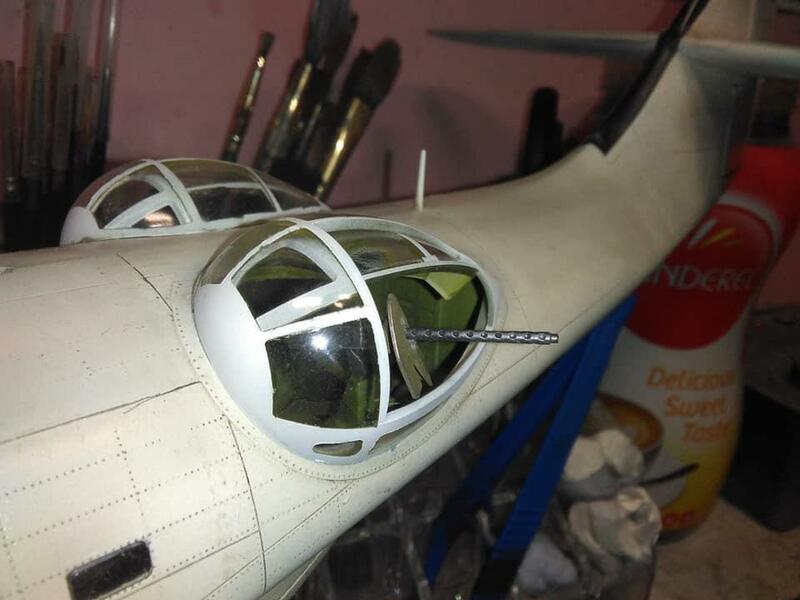 Thanks for sharing an outstanding kit of the Catalina. Nicely done Malcolm, that’s a good looking cat. Can’t quite tell what color you painted her. Off white or a very light blue? Those “old” Monogram kits still stand the ‘test of time’ IMO…nice job on this. 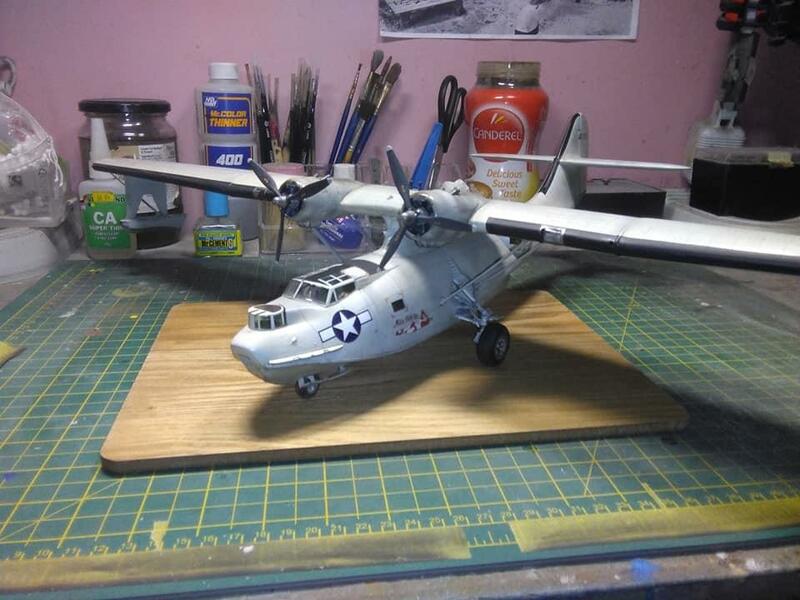 I can’t imagine how big a 32nd scale Catalina would be – yikes!. Very good job Malcom. Like others said, not your daily subject post. I like the Catalina, it’s a unique looking plane and Monogram delivered what it is still the best game in town to build it. I had a “Cat” flying over the sunset carved into Dad’s gravestone. Realistic look of a well used aircraft, even the tires are worn. Superb build. I love it. Your Catalina build is excellent. It’s something you just don’t see built up all that often. I built one as part of the “Midway” group build a little over a year ago. It is a fairly large model in 1/48 and takes up some real estate inside the display case. 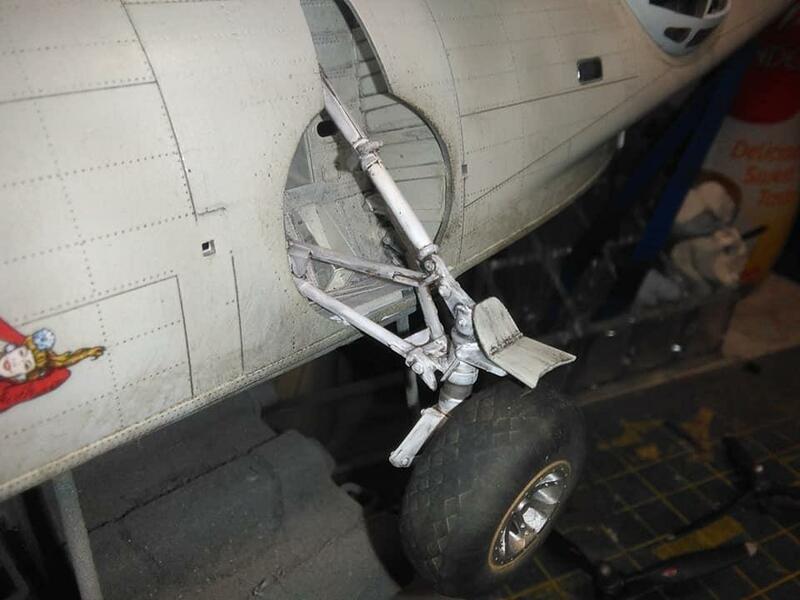 I had a problem with understanding exactly how the landing gear was to be assembled……… Luckily for me, our friend Tom Bebout @tom-bebout took some pictures of the restored example at the Air Force Museum in Ohio, and sent them to me. Once I had the pictures in hand, it all made sense. If I’m not mistaken, wasn’t the white color camouflage used on aircraft against U-Boats in the Atlantic ??? The landing gear is confusing, but like you I had my own close up photos so could work it out. The white was used in the Atlantic. Nice work. Don’t go spend the national debt on the resin 1/32 kit. There are rumors of an injection-molded kit in that scale. Don’t hold your breath waiting or you’ll turn blue and die. Anyway, unless I’m mistaken that is a chopping board your Catalina is at rest on. This provokes several observations. First, possibly you have no partner in which case all household objects are fair game at being pressganged into service. Or, your partner is happy for you to do so, in which case I suspect you have not been together long. Also, said chopping board is pristine so perhaps it was purchased specifically for its photographed purpose – in which case, nice choice – looks great. Which brings me to my last point. That fact that all I can comment about is the chopping board merely illustrates the near perfection of your Catalina. Sorry, we’ve run out of coffee this morning. A beauty of a Catalina. As mentioned above, you do not see this model finished a lot. This Monogram is a real winner. It looks great. Very well done “CAT”! Love it. Great finish and overall outcome! 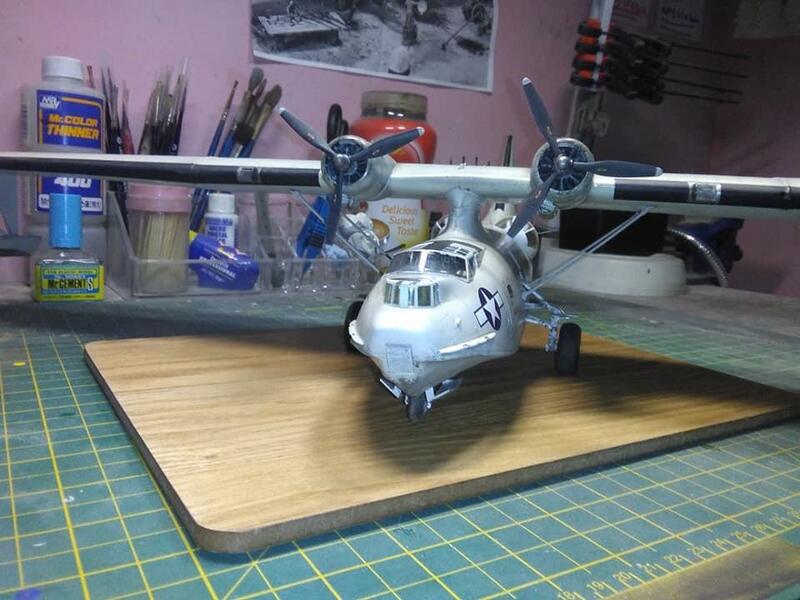 It looks like a real PBY. Looks great! I like the weathering work you did on her – very nice! Lucky man, Malcom – on all counts!